Ai-jen Poo is the Director of the National Domestic Workers Alliance (NDWA) and Co-director of the Caring Across Generations campaign. Named one of TIME’s 100 “Most Influential People in the World” in 2012, Ai-jen is also the winner of a 2014 MacArthur Foundation Fellowship and most recently was on Fortune.com’s World’s 50 Greatest Leaders list. Her book, The Age of Dignity, was released in February 2015. Follow her @aijenpoo. 1MFWF: America is about to experience what you call an “elder boom”. How will this shift necessitate a new approach to elder care? 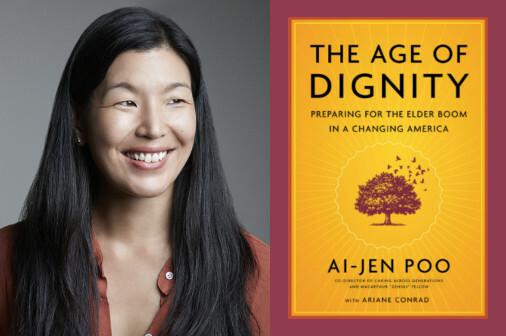 Ai-jen: We are entering an unprecedented situation: by 2030, 20 percent of our population will be over the age of 65. The Baby Boom generation reaching retirement age and advances in health care and technology that are allowing us to live longer mean that by the year 2050, 27 million of us will need some form of care or support to meet our basic needs. And we’re already beginning to experience the impacts of this elder boom in our families. Millions of Americans are caregivers for aging parents, with little support from either the private or public sectors to help balance the demands of work and caregiving. And all but the wealthiest among us find it hard to afford the care we need, or that our parents need, as we all age. The average cost of a private room in a nursing home is approaching $100,000 a year, and the programs that we depend on as we age, like Medicare, don’t cover the costs of long-term care. Caring for our families shouldn’t be a luxury, and we’re going to need to come up with innovative solutions in the private market and in public policy in order to make quality care accessible to all American families. Different from the past, long-term care is increasingly delivered in the home and community, rather than in a nursing home or hospital. The medicalization of aging has driven policies and cultural expectations that are biased toward an institutional model of care, even though 90 percent of people prefer to age at home. The truth is most of us don’t want to go to a nursing home—with some important exceptions, they’re often dehumanizing places that rob people of their freedom and dignity. Yet the majority of our public dollars that do fund long-term care services go to nursing homes. We need a new approach to caregiving in America. We need to shift away from the institutional model of care to more of a home-based model that honors our humanity and dignity. This will require investing in a strong, well-trained home care workforce. 1MFWF: Caregiving has traditionally been marginalized as a woman’s responsibility, and undervalued as not being “real” work. What are some of the reasons we need to rethink this model? Ai-jen: Caregiving is and always has been associated with women, like many other kinds of unpaid work in the home. It’s often taken for granted that women will be the caregivers in our families, from caring for children to our elderly parents. And so we’ve done it, whether as unpaid and unacknowledged family caregivers or as low-paid professional caregivers like home care workers and domestic workers. But with more and more women entering the workforce, this is becoming increasingly unsustainable. Right now, home care is the fastest growing occupation in the country. And as a result of the ways we have undervalued the work, we find ourselves in a situation where the workers that we count on to care for our loved ones, who are primarily women of color and a growing number of immigrants, are paid so little that they can’t support their own families. The average wage is still around $9 an hour, and almost half of care workers rely on public assistance to survive. The truth is, care work is difficult, skilled work. Caregivers are on the front lines of ensuring the health and well-being of millions of people, and need to be integrated into how we think about truly person-centered or consumer-directed health care. Simultaneously family counselors, mediators, cooks, medical administrators, entertainers and healers, care workers not only contribute to our productivity as a nation, but to the well-being and quality of life of millions. 1MFWF: You note that as the workforce becomes increasingly comprised of self-employed, temporary, contract, and freelance workers, new alliances, associations, and cooperatives will emerge. How do these shifts relate to caregiving? Ai-jen: Professional elder caregivers themselves are increasingly self-employed or contract workers. Too often, this means that they work in what’s described as the shadow economy—with few benefits, guidelines or standards, and protections. But this isn’t just a challenge—it’s also an opportunity to innovate and develop new models of organizing and new ways to use legislation to improve labor standards and working conditions. At the National Domestic Workers Alliance, we’ve successfully passed Domestic Workers Bills of Rights in four states to establish basic protections for the domestic workforce, and are working to pass similar laws in other states. As this freelance, contingent economy grows, it creates opportunities not only for caregivers to come together and take collective action, but for workers from all walks of life and professions to reinvent the way workers break out of isolation and exercise their collective voice. 1MFWF: Work flexibility is often touted as an accommodation for workers with children, or a new way of working for millennials. But as our population ages, flex will also be increasingly critical for family members with aging relatives. How many people are part of the sandwich generation, and how could work flexibility help alleviate some of the pressures they face? Ai-jen: Nationwide, there are at least 40 million adults who are caregivers for an aging parent, a spouse, or other loved one who needs additional assistance. Many of these are part of the “sandwich generation”—family caregivers who are squeezed between caring for an aging parent and their own children. One member of this generation who is a part of our campaign calls it the “panini generation,” because they’re so pressed and overwhelmed. And the typical member of the panini generation is also working, either part- or full-time. Work flexibility is critical for a caregiver of an aging parent. Health problems or situations that arise with your 80-year-old mother, particularly if you are caring for someone with dementia or Alzheimer’s, are extremely unpredictable. It’s so important for employers to understand the caregiving needs of their employees, and to have policies that understand people have responsibilities outside of the workplace. This can look like anything from flex time to paid family leave and paid sick days to offering long-term care and child care benefits to your employees. Workplaces and employers can help lead the way toward a more caring economy by adopting these practices and policies. And, ultimately, we’ll need both responsive workplaces and bold public policy change and investments in a new long-term care system in order to address the elder care needs of all of our families.